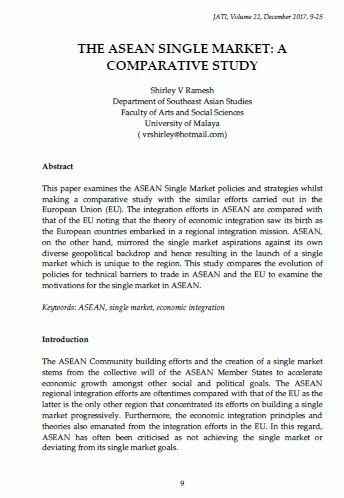 This paper examines the ASEAN Single Market policies and strategies whilst making a comparative study with the similar efforts carried out in the European Union (EU). The integration efforts in ASEAN are compared with that of the EU noting that the theory of economic integration saw its birth as the European countries embarked in a regional integration mission. ASEAN, on the other hand, mirrored the single market aspirations against its own diverse geopolitical backdrop and hence resulting in the launch of a single market which is unique to the region. This study compares the evolution of policies for technical barriers to trade in ASEAN and the EU to examine the motivations for the single market in ASEAN. V RAMESH, Shirley. THE ASEAN SINGLE MARKET: A COMPARATIVE STUDY. JATI - JOURNAL OF SOUTHEAST ASIAN STUDIES, [S.l. ], v. 22, n. 1, p. 9-25, dec. 2017. ISSN 2600-8653. Available at: <https://jati.um.edu.my/article/view/10243>. Date accessed: 20 apr. 2019. doi: https://doi.org/10.22452/jati.vol22no1.2.